We take a look at some of the many St. Patrick's Day updates in Game Insight's mobile titles. Social and mobile game developer and publisher Game Insight is celebrating St. Patrick’s Day in a big way, updating many of its mobile titles with leprechauns, pots of gold and other items and quests to help gamers feel festive. Here’s a look at some of these game updates, now available on mobile devices for a limited time. 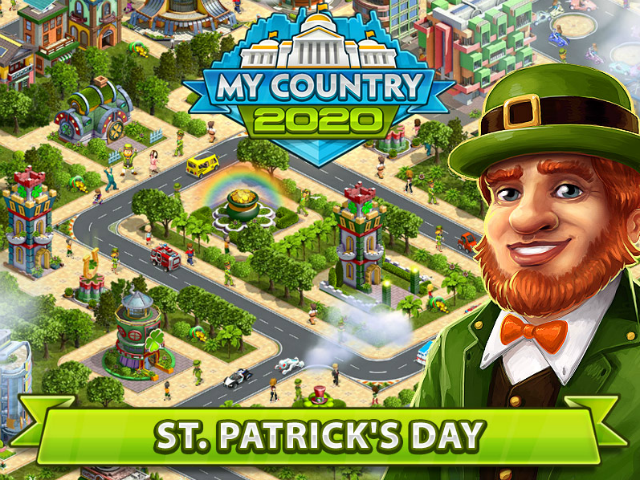 2020: My Country (iOS, Android, Windows Phone, Amazon) – This city-building game asks players to help Leprechaun prepare for St. Patrick’s Day by completing a series of new quests. Along the way, gamers will help Leprechaun recover his stolen coins by defeating the thieves running around in their friends’ cities. In addition, players can decorate their towns with over 20 festive items, including a St. Patrick’s Pub, Lucky Horseshoe Harp and a Pot of Gold. Airport City (iOS, Android, Windows Phone, Amazon) – In this airport management and city-building title, players will collect four-leaf clovers, banish leprechauns from their city, and gather items to finish a collection of ancient Celtic items. New travel routes are available to cities including Dublin, Cork and Limerick, with the reward for completing this event being an Irish Pub. Big Business Deluxe (iOS, Android, Windows Phone, Amazon) – This business simulation game will have players completing quests to build St. Patrick’s Cathedral in their towns, among other features. Mystery Manor (iOS, Android, Amazon) – This hidden object game introduces players to a set of new holiday-themed characters, including the Fairy of Fortune, Snatchin’ Shoemaker and Elder Leprechaun. Players will collect gold, silver and copper coins from the Leprechaun Treasury area, while completing a series of 20 quests detailing the history of St. Patrick’s Day. For a limited time, players can also collect the Leprechaun Lyre amulet for their games. Paradise Island (iOS, Android, Amazon) – This tropical resort-building game has been updated with a set of Leprechaun tourists, who will walk alongside regular tourists throughout the resort. In addition to giving these characters refreshments, players will work to build St. Patrick’s Cathedral in their resort. A themed balloon-popping mini-game is also available for a limited time. The Tribez (iOS, Android, Windows Phone, Amazon) – Players of this tropical city-builder will work to earn a unique Tavern as a reward in the game’s St. Patrick’s Day event, which sees them catching leprechauns to retrieve stolen jewelry.